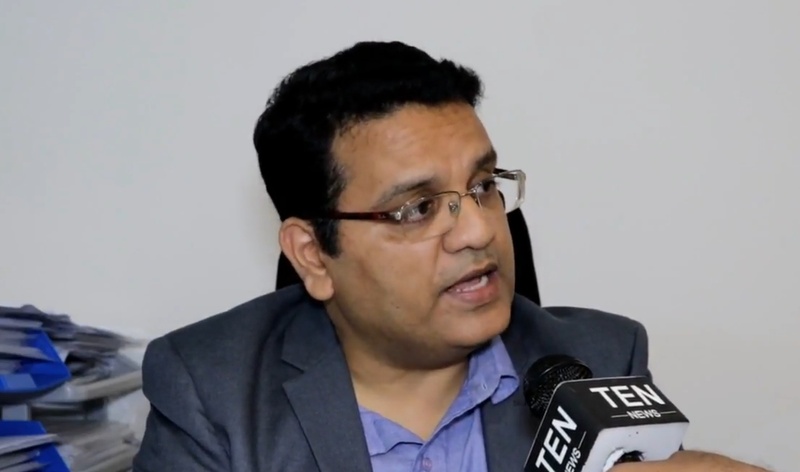 Noida: In a Exclusive Chat, Rajesh Pasari, Director Finance and Operations, India and Finance Director Australia and MENA, sits down with Ten News to share his vast experience working in a Publish industry. Tell us about your vast experience with Publishing Industry and how has it changed over last few years? I have spent over half a decade in the Publishing Industry and am currently working with one of the most prestigious brands in the country: Macmillan Education. We celebrated 125 years in India last year and our curriculum and learning materials reach over 10 million students every year. I joined Macmillan as a CFO and was fortunate to be elevated within a year of my joining to become the co-head for Macmillan’s business and operations in India. From the very beginning, it has been an exciting and challenging stint. After the merger of Macmillan Science and Education with Springer Science+Business Media in 2015, I was privileged to take responsibility as Finance Director for Macmillan Education in MENA (Middle East and North Africa) over and above my India role as the co-head of the business. In recognition of the good work done by me and my team in MENA, Australia was added to my role – which is a more mature market as compared to the rest of the world. 1. New digital learning formats: e-books, interactivities, gamification of learning, augmented reality and learning management systems. 3. Development of 21st century skills, such as collaboration, communication, problem solving, critical thinking, which will make students more employable and not just knowledgeable. 4. Adaptive & personalized learning – Using educational technology that responds to students’ interactions in real time. Based on a student’s response to a particular question, tools provide relevant hints, corrective feedback and resources. This means the student has the flexibility to design their own learning path depending upon their needs and learning styles. Macmillan, being a leading publisher of English Learning and academic publishing, what are the key differences you see in terms of global academic curriculum and its Indian counterpart? Macmillan is known globally as an English Language Teaching (ELT) publisher and we are present in over 70 countries with our global Language Learning resources which adhere to Common European Framework of Reference (CEFR) norms. These resources are used to teach English as a second language to non-native speakers of English in countries around the world, including Mexico, Brazil, China and many more. In these countries, their academic curriculum is in their native language and learners study English outside the academic curriculum. In India, all private schools teach the academic curriculum in the English medium. Macmillan creates local curriculum resources for use in the formal education system to teach English as a 2nd language and for other subjects like mathematics and science in the English medium. These resources are locally designed and created to address varying linguistic levels and diverse cultural contexts in India. Thus, global resources can address generic language needs of adults wanting to learn English in language schools but cannot be used to address specific curricula as defined by NCERT. Our local curriculum resources meet local needs and are adopted by schools and colleges. Piracy remains one of the major problems of publishing industry? How do you think it can be effectively tackled? Piracy in academic publishing stems from the fact that the publishing industry is so fragmented in India, with over 5000 thousand publishers – big and small. There are few barriers to entry and some dishonest printers or distributors may take content from existing textbooks to create books under their own name. These books are often of poor quality for learning and they can be biased and factually inaccurate. This practice is difficult to challenge in India, despite attempts through the Publishers’ Association, and court orders leading to raids against those participating in this illegal practice. On the way forward, it would be a great idea to have a regulatory body for K-12 education which firstly creates an entry barrier and lays downs norms for publishing and secondly monitors the quality of content – it should be free from bias, factually correct and ensures learning. At the same time, it is important to strengthen the legislation to ensure swift action against copyright infringement All these steps taken together will help to curb piracy to a large extent, though complete eradication will be very challenging in the next few years given the extent of the issue and size of the country. I am hopeful that as move into digital learning, with licensing of content and access restrictions, piracy will come down. With world going digital, how has been impact on hardbound publications? How do you see the increasing competition between the two formats? Well, the world is certainly going digital and so is educational publishing. In India, the impact is being seen across all segments – trade business, higher education and K-12. That said, K-12 globally follows a blended approach as learners at elementary level require more face-to-face time with teachers for motivation and interaction. Schools expect digital content to be given with the print books and most publishers offer some amount of digital learning resources. What is being widely accepted and appreciated by schools is digital content which complements the print content and supplements a teacher’s teaching. In the right blend, print and digital boost students’ achievement. There is no competition between the two, only collaboration. Macmillan has been successful in offering pedagogical blended resources to one of the largest chain schools of the country, and has seen it working seamlessly for the past 6-7 years. You also head the Finance for Macmillan’s Australia and MENA (MiddleEast and North Africa) Region, so what are the differences that you encounter in these demographies? Well the core of publishing is similar across geographies. It is different in terms of government policies, for example in the Middle East, especially Egypt, Saudi Arabia, the government plays a very active role in the kind of content to be used for education while in much more mature markets like Australia schools have a free-hand to decide on the type of content they require. Also, the average price of a book is much higher in Australia than India, even when compared apple to apple. So, I still maintain that the books are relatively cheaper in India than outside it. Another difference is the quick acceptability of innovative products in MENA & Australia as compared to India. India as a country has still long way to go to get out of the rote mentality, even though we are seeing the change in methodology in metro cities. At Macmillan we are experimenting with international content and how it can best fit into the school curriculum, maybe with some contextualization. This year, we have introduced CPA Maths which is based on the renowned math pedagogy known as the Singapore approach. Overall, I see a global amalgamation of education system across geographies in future but how fast India adapts to it is anyone’s guess. Keeping in pace with the changing education trends, Macmillan has also ventured into eLearning solutions? So how do you view this transformation? The digital transformation is underway in India and has been a learning process for all of us, a continuous and evolving journey. We are exploring new ideas and innovating solutions to make the teaching-learning experience engaging for our users. We believe in being proactive partners so we spend considerable time understanding customer needs before we work on providing new solutions to them.eLearning solutions need to engage all learners and encourage them to find their individual paths to learn and succeed. The solution must be useful to teachers and create learning space for learners using visual, auditory, or kinaesthetic styles. Our tools include Learning Management Solutions (LMS), reliable assessments, game- based learning Apps, learning videos or animations, support materials for teachers in the form of slideshows or worksheets, interactive activities, etc. We see a huge divide among rural and urban education sector of India? So what is the core market for Macmillan publication and as a leading publisher are there any specific efforts being made by your publication house to reach out to maximum number of students with quality education material? Well, I would rephrase this statement. There is structural difference between the rural and urban education. While you would have an option to choose CBSE/ICSE or state board in a city because of availability of all kinds of schools, this option does not exist in rural India. All you have is a local village level primary education without any gradual progression to a state board. I think the government needs to penetrate more and have secondary schools across the country. Macmillan has a fantastic penetration in Tier 1,2 and 3 cities, covering schools which cater to the entire middle- income class. Macmillan is committed to meeting needs of local communities with geographically appropriate resources for all learners, irrespective of urban or rural milieu. Out of the 1.5 million schools in India, 1.1 million are government owned and the rest are private schools. To make an impact we work with both private and government schools. In the organized private school market, Macmillan addresses around 50,000 schools in Tier 1, 2 and 3 cities (mostly urban) with approx. 50 million students. We are proud to say that every student in a private school would have studied from a Macmillan textbook at some stage of his life. As an education company we make efforts to work in partnership with State Boards like Meghalyaya, Manipur, Delhi, Chattisgarh and others, to reach students in rural areas, with quality resources. We customize our resources to meet the learning levels and suit local contexts. In Delhi we are currently working with 1028 Delhi government schools to improve spoken English skills of students. As part of our approach to Corporate Social Responsibility, we work with government schools for Hygiene & Sanitation providing training and education. There has been many whispers about “Saffronisation of Education, as a publisher have you encountered any efforts? What’s your view on the controversy? Macmillan resources are created in accordance with principles defined in the Constitution of India and are free from any bias or prejudice towards gender, caste or creed. We have not faced any challenges or pressures to modify our content or any interference from any external body. Additionally, our resources follow the guidelines in National Curriculum Framework 2005 given by NCERT.